The Electric Hoist & Manual Ball Trolley Kit is rugged, portable, and provides quick and precise lifting of industrial batteries and other heavy loads. Two-ton and three-ton capacities are available. 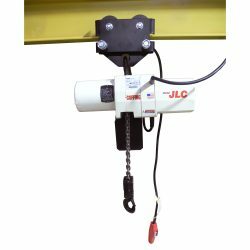 The kit includes an electric chain hoist with manual trolley, chain container, and a two-button pendant. These hoist and trolley kits are designed to work with BHS Gantry Cranes. This heavy-duty equipment is constructed from tough but lightweight die-cast aluminum housing. Its durability allows it to work in harsh conditions like battery rooms, foundries, or raw material production facilities. Heat-treated, alloy steel gears and an overload-limiting clutch give the oil-bath transmission a smooth and reliable operation. The standard pushbutton station fits comfortably in one hand. Lifting heavy loads is simple, ergonomic, and reliable with a BHS hoist and trolley kit. Safety and ergonomics play a key role in the Electric Hoist & Manual Ball Trolley Kit. The magnetic disc brake provides sure stopping and secure holding of the load. Adjustable upper- and lower-limit switches regulate load travel. Make lifting industrial batteries or other heavy loads easy and safe with the Electric Hoist & Manual Ball Trolley Kit. Contact our sales team at 1.800.BHS.9500 to learn more about hoist kits or other Battery Handling Equipment.